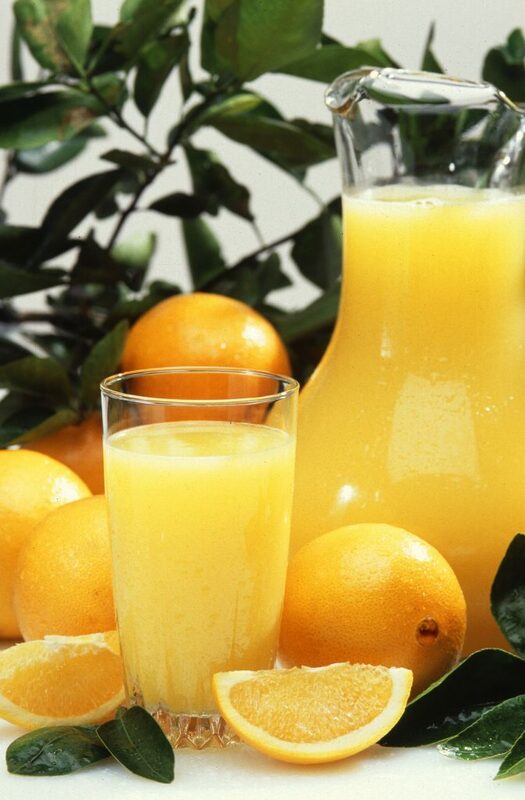 Fruit juice for babies–it’s a dietary norm in the United States. The American Academy of Pediatrics thinks this normal dietary habit needs to stop. This week, they went a step further and said NO to juice for babies. Period. Let’s face it, juice tastes good and it’s easy to drink. Babies and toddlers have high nutrient requirements and small tummies, so too much juice can lead to poor growth due to lack of nutrients like iron, zinc and calcium that they may be missing out on. Too much juice can also lead to overweight. I’ve seen it in my practice over the years. Kids filling up on juice and eating little else. Babies drinking too much juice and having diarrhea as a result. Kids sipping on juice all day and ending up with caps on their front teeth due to tooth decay. What if Your Baby is Hooked on Juice? Oops. Time to nip that in the bud. First, remember that parents and caregivers are “in charge” of providing healthy foods for the family. Children (and babies) are in charge of deciding if they want to eat it–or not. That takes the pressure off of both of you. Stand firm in your offerings. Your baby will learn the rules quickly. Know that babies under 6 months get enough fluid from breastmilk and formula, except for during unusually hot or humid weather. If your young baby is drinking juice, simply cut it out and give breastmilk or formula on demand as usual. Instead of fruit juice, offer either pureed fruit or tiny pieces of soft fruit that baby can pick up with her fingers such as ripe banana, pear, mango or peaches. Try pureeing frozen fruit into a slush and let her eat it with a spoon. Make it fun and give her choices. Limit juice to once a day and make sure to brush teeth afterwards. Cut back on the amount of juice you give. Instead of filling up his cup with juice, only fill it half way or less. Teach your baby that “all gone” means no more for the day and eventually stop it completely. Never give juice in a bottle. This is more likely to lead to tooth decay. Dilute it with water and increase the dilution so that at the end of a week, there is very little juice and mostly water. Puree fresh fruit and offer it by spoon, or for older babies, freeze it and offer as a frozen pop. Most importantly, set a good example for your children by snacking on fruit and limiting fruit juice yourself! What about juice for older children? 1-3 years: Limit to 4 ounces (1/2 cup) per day. 4-6 years: Limit to 4 to 6 ounces (1/2 to 3/4 cup per day. 7 to 18 years: Limit to 1 cup per day. 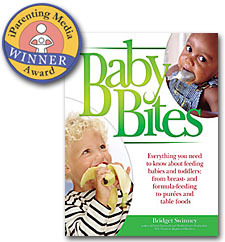 Everything you need to know about feeding your baby or toddler is here! « 3 Healthy Apps Your Kids Will Love! Great advice! Thanks for sharing 🙂 I love that you gave practical advice for cutting back. Thanks Erica! Cutting back on juice can be tough! Love that you’re writing about this, Bridget! I’m often having this conversation with parents and it’s so important! So important for parents to know! Thanks so much for sharing! Setting a good example is always the best tip for parents! Interesting! Great post, thanks for sharing! Such great tips and an excellent way to introduce healthy eating to toddlers; let’s start them young! Yes I agree! Eating habits learned in childhood usually persist into adulthood!